Director Warwick Thornton's Sweet Country comes to UK/ROI cinemas March 9th. Best known for his 2009 drama Samson & Delilah, director Warwick Thornton returns with Sweet Country, a historical drama/outback western which explores prejudice in colonial era Australia. Hamilton Morris stars as an aboriginal man who becomes a fugitive following his involvement in a fatal shootout. The film also stars Bryan Brown and Sam Neill. 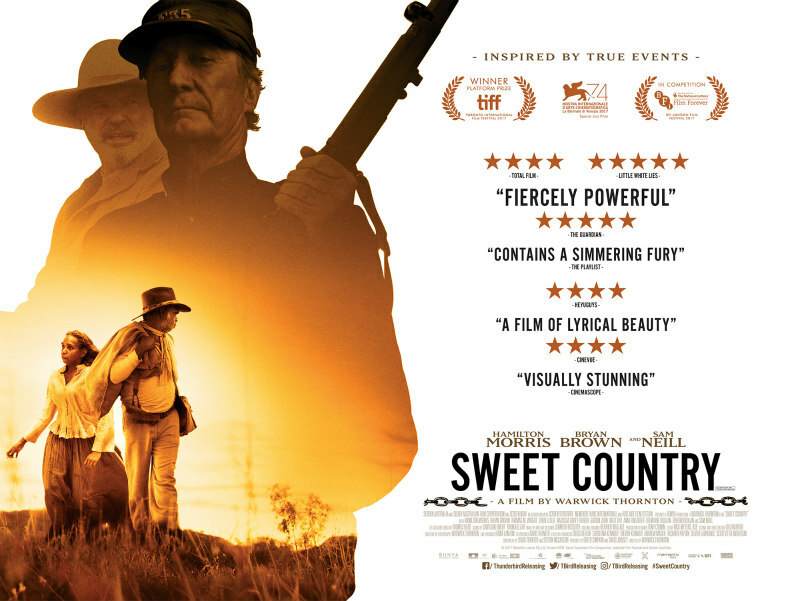 A sweeping, historical epic set against the brutal backdrop of a stunning Australian landscape, SWEET COUNTRY follows the story of Sam, a middle-aged Aboriginal man, working for a preacher in the outback of Australia’s Northern Territory. When Harry, a bitter war veteran, moves into a neighbouring outpost, Sam and his family are sent to help Harry renovate his cattle yards. But Sam’s relationship with the cruel, ill-tempered Harry quickly deteriorates, culminating in a violent shootout. Sam becomes a wanted criminal for the murder of a white man, and is forced to flee with his wife across the deadly outback, through glorious but harsh desert country. A hunting party led by the local lawman Sergeant Fletcher is formed to track Sam down. But as the true details of the killing start to surface, the community begins to question whether justice is really being served.